WASHINGTON – A new EWG analysis of serums and essences, popularized by Korean beauty, or K-Beauty, finds that about 40 percent of the products were formulated with less hazardous ingredients. U.S. sales of K-beauty products have increased by almost 300 percent in the past two years alone. 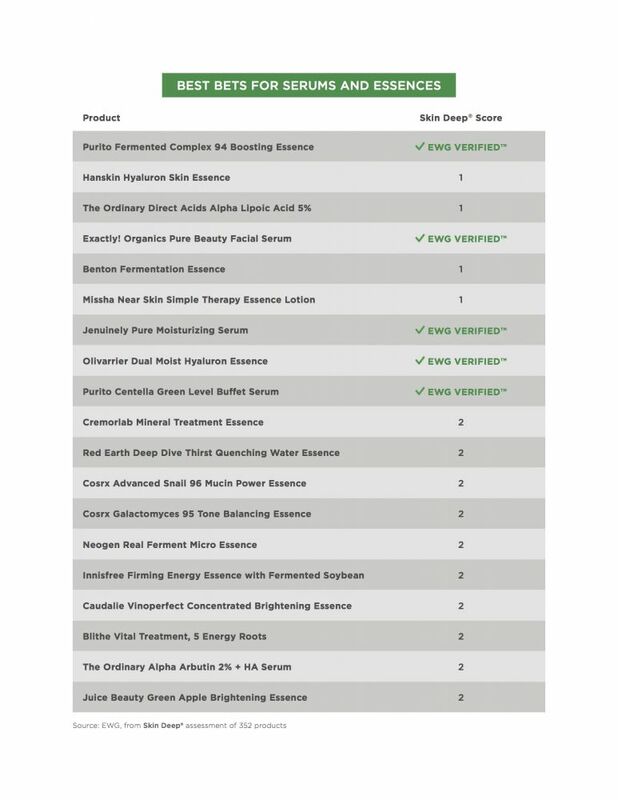 EWG researchers analyzed 352 products in the Skin Deep® database from U.S., European, Korean and other Asian companies, looking at the hazards posed by the ingredients and the price point per fluid ounce. Skin Deep assesses products based on the hazards associated with their ingredients. Consumers often assume that more expensive skin care products are made with healthier ingredients. This is not always the case. Many of the green-scoring products we assessed cost less per fluid ounce than did products with worse scores. Some of the most expensive products – costing as much as $640 per fluid ounce – scored in the red range. EWG researchers found that companies can make a trendy personal care product that also meets the rigorous standards for health and transparency dictated by the EWG VERIFIED™ program. The ingredient “fragrance” was found in nearly half the products evaluated. Ingredients classified under this umbrella term can be made up of a mixture of more than 3000 chemicals, including endocrine-disrupting phthalates. EWG’s assessment found some serums and essences also contained long-chain parabens, which have been linked to endocrine disruption as well. Endocrine disruptors often mimic hormones and disrupt the body’s endocrine system. This disruption affects many normal processes and development in the body. Exposure to endocrine disruptors has been linked to infertility, an increased risk of cancer, harm to metabolism and interrupted brain development. Consumers can use resources like Skin Deep to avoid products made with endocrine disruptors so that they decrease their overall body burden. A new study from the Center for Environmental Research and Children’s Health at the University of California, Berkeley, found that exposure to endocrine-disrupting chemicals used in a wide array of personal care products has been linked to early puberty among girls. Until Congress updates the law regulating cosmetics, consumers need to rely on third party seals to know which products meet the highest standards for transparency and health. With the EWG VERIFIED™ mark, consumers know that researchers have found no worrisome ingredients, like the potentially harmful chemicals hidden under the umbrella term “fragrance,” and that the companies use good manufacturing practices. Cosmetics are woefully underregulated, and companies are not required to test their products for safety before they hit store shelves. Until the laws are strengthened, consumers should choose products that score well in Skin Deep or have been verified by EWG. They should also support companies that have reformulated their products to make them healthier. If a favorite product scores poorly, consumers should contact the company and tell it to do better.